KIEV, Ukraine -- A female candidate for President with a long record of public service is seen as overly ambitious and corrupt. As a “creature of the system,” the woman is thought by many to be out of touch with the needs of everyday citizens. 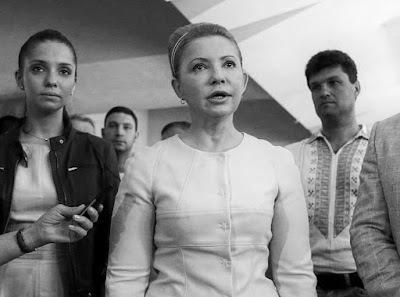 Ukraine’s presidential candidate Yulia Tymoshenko speaks to press at a polling station during the presidential election in Dnipropetrovsk, Ukraine, Sunday, May 25, 2014. No, I’m not talking about America in 2016, this is Ukraine in 2010. The woman, Yulia Tymoshenko, who Ukrainians tend to refer to as simply “Yulia,” much as everyone calls Secretary Clinton “Hillary”in America. Despite Yulia’s widespread reputation for competence, the voters chose Viktor Yanukovych, a man with two past convictions for violent crimes and a well known penchant for corruption. The parallels don’t stop there either. Both Yanukovych and Donald Trump often expressed admiration for Vladimir Putin and his authoritarian approach. Both hired Paul Manafort to smooth out their image and hone their populist rhetoric. Once in office, Yanukovych jailed his opponent, just as Donald Trump threatened to do to Hillary Clinton. Yanukovych turned out to be even worse than expected. His record of incompetence and corruption was unprecedented even in Ukraine, which had never been known for its sound governance. I remember living in Kiev at the time and noticing how even basic services, like snow removal, seemed to grind to a halt. It was as if the country solely existed to enrich the President and his cronies. In November 2013, Yanukovych backed out of a EU trade deal that had been a key campaign promise and the whole country erupted in what is now known as the Euromaidan protests. The regime brutally cracked down on the protesters, ultimately killing scores of them. Finally, even his staunchest supporters knew he had gone to far. He was ousted and currently lives somewhere in Russia. To be clear, America is not Ukraine and Donald Trump is not Viktor Yanukovych. We have been building our democratic institutions for 240 years and are the most powerful country on earth. Ukraine was dysfunctional long before the election of 2010. Donald Trump, for all of his warts, has never been convicted of a crime, much less a violent one. I write this not to say we will meet the same fate as Ukraine, but rather to point out that elections have consequences. Donald Trump is now the leader of the free world. While we should all, as Secretary Clinton put it, “keep an open mind” and offer our support, we should also hold him to the highest possible standards. Our fate, in large part rests in his hands. The President of the United States should not be graded on a curve. Tymoshenko was corrupt - very corrupt - to the core. And there is no evidence of any "competency". She, and her cronies pillaged Ukraine as much as any who came before her, while leaving the country with a huge multi-year gas burden that even her crooked and treasonous successor had difficulty resolving with Putin. The country rejected her for good reason. They had the evidence of her 10 years of "public service" (just as the US electorate had evidence of Clinton's 2 decades of "public service". It is most unfortunate that they had no other option but to turn to an even worse contender for the presidency. Yanukovych was a Russian puppet from day one. The only thing that he cared about was to enrich himself and secure a position as Ukraine's leader for life. Trump, for his part, is dangerously ignorant as to Russia and Putin, and this ignorance may yet prove disastrous for both Ukraine and the U.S., but he is not a puppet. Depending on the action he takes toward Ukraine and Russia, he may simply end up as the Kremlin's "useful idiot". While Trump's background and character is far from what we would expect of a U.S. president president (the "lesser of 2 evils" may be an appropriate description for Trump), he will be constrained by the sensible and competent people he appoints and by the Republican/conservative "institution" and Congress he inherits. Except for the yet very serious and unanswered troubling questions regarding his decisions on Ukraine, Russia, and NATO, he and his administration will be a vast improvement on a wide range of issues and problems confronting the U.S.- problems resulting from the fruitcake policies of the Obama administration. Trump is a bad news for Ukrainian Government and good news for Ukrainian people.